Do you long to travel? Do you want to be swept away on a Cinderella-style adventure? Monte Carlo, starring Selena Gomez, Leighton Meester and Katy Cassidy, might be the movie that makes your summer (and it’s in theatres now)! 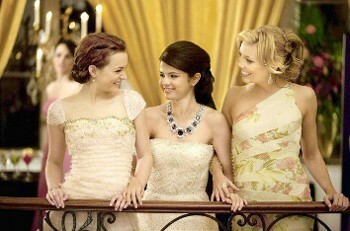 Best friends Grace (Selena Gomez) and Emma (Katie Cassidy) plan to go on a European adventure right after their high school graduation, and at the last minute Grace’s stepsister Maggie (Leighton Meester) joins in on the plan, but we soon realize that Maggie and Grace have a rocky relationship. The girls set off for Paris with high hopes that are soon dashed when their dream vacation goes wrong in all sorts of ways, leaving them miserable and disappointed. And while we feel bad for the poor girls, their troubles are pretty funny. Their disaster vacation takes an interesting turn however when they cross paths with and heiress named Cordelia Winthrop Scott who looks exactly like Grace! In a case of mistaken identity the girls are whisked off to Monte Carlo for a lavish holiday, with Grace forced into pretending to be the snobbish heiress Cordelia! Selena Gomez takes on the difficult job of not only playing two different characters, but playing one character pretending to be the other! While in Monte Carlo Grace finds herself in the possession of an incredibly beautiful and expensive necklace to be auctioned off for charity. Believing she’s the real heiress, Theo, a man who works for the charity, begins to fall in love with Grace (and Grace feels the same way!) But Grace isn’t the only one exploring her heart. Maggie falls head over heels for an Australian tourist, and Emma finds herself questioning her relationship with her eager long time boyfriend Owen, who proposed before she left. We love seeing Selena Gomez expand her acting range by taking on this challenging role, and you can never go wrong with a feel-good Cinderella story, especially one that takes you on a romp through exotic and romantic locations. The real standout talent in this summer flick is Leighton Meester, even though we love seeing Katie Cassidy and Selena Gomez stretch their acting muscles too. If you’re looking to escape from reality for a while, go see Monte Carlo! Take a look at the trailer below! Monte Carlo on DVD October 18!